A tortoise shell Art Deco novelty clock in the shape of a radio from the 1930s. 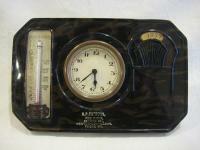 Has a thermometer, clock and year dial for the 1930s. Unusual piece. A walnut writing slope C1900. 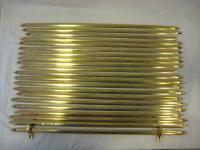 Has ebony stringing around the edge and a brass plaque to the top and a large brass lock. The inside has a replacement black leather with gilded detail. 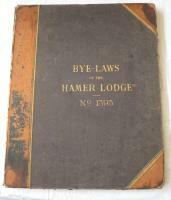 Bye laws hamer lodge No 1393 Masonic rule book dated 1893 Liverpool. A large antique pine framed blackboard with hooks either side to hang on wall. Was probably a pine mirror but has been converted to be used as a blackboard. 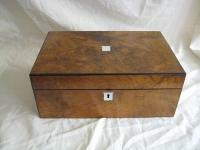 A Victorian burr walnut writing box with mother of pearl escutcheons. 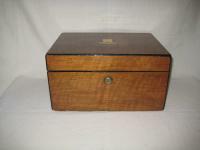 The lid opens to reveal a red lined interior and the box still has its original ink well with brass lid. A typical 1940s bakelite telephone with original cable. The dial works as smoothly as the day it was made. Could be converted to work with current standards. An antique spelter figure of a knight in battle. Stands on a wooden base with four bun feet. The blade of the sword is missing.